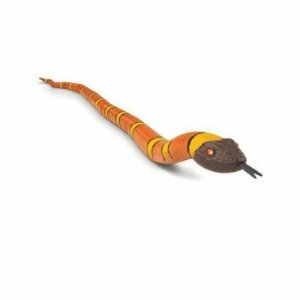 R/C Snake Orange Gold & Black Mamba- This RC snake is the coolest around with its realistic slithering action! The unique snake egg remote control sends it across any hard smooth surface. You'll swear it's the real thing! 'Snake Egg' 4-way remote control; Light-up eyes; Over 20 inches long! Batteries required (not included): Snake requires 3 AAA batteries; remote requires 2 AA batteries. Ages 6 and up (adult assistance recommended).